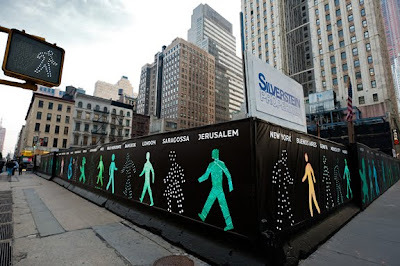 On the subject of symbols and icons, I saw today on Design Boom an interesting post about a new public installation in New York, where designer Maya Barkai has created a wall of 99 traffic light icons from different cities around the world. Each icon is a green crossing man, recreated to human scale, and the cities featured include Warsaw, Barcelona, Tel Aviv, Vancouver, London, Beirut, Kyoto, Sydney, and of course New York. The installation, presented by the Downtown Alliance Public Art Program, is at 99 Church street in downtown Manhattan and runs till January 2011. It looks brilliant and you can check out more pics on the aformentioned Design Boom post, and at the offical site, walking-men.com.